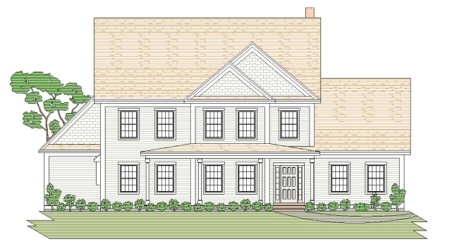 This 4 bedroom modern colonial home plan has an open concept large country kitchen and living room. The kitchen has a bump-out breakfast bay, and a fireplace. There is also a formal dining room. The second floor has 3 closely sized bedrooms for the kids, a double duty bathroom, a laundry, a really nice master suite, and a large recreation room to kick back and relax in. Th 2 car garage has an easy access to the full cellar eliminating the bulkhead. 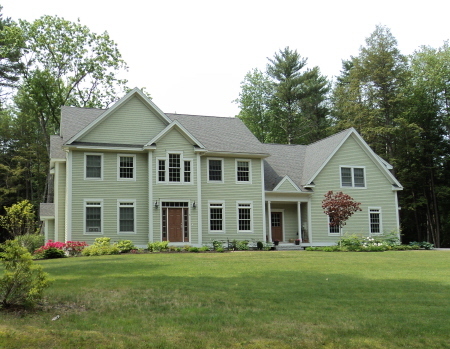 Could you ask for anything more that this absolutely beautiful 4 bedroom modern colonial home. This plan has so much going for it. 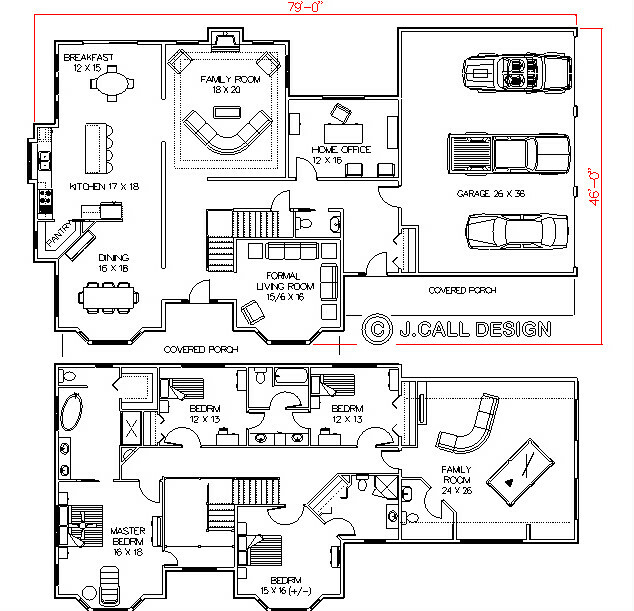 The first floor has a large open concept living area, a den or formal living room, and a formal dining room. Upstairs it has 3 about equal kids rooms and two kids bathrooms, a laundry, and a wonderful master suite with a tray ceiling. The two car garage has our preferred easy entry to the full cellar. 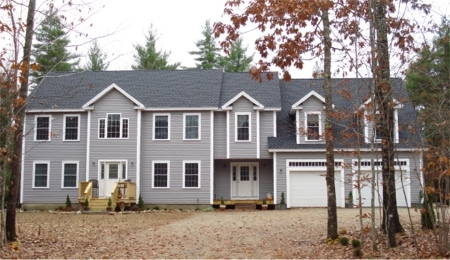 This absolutely beautiful 4 bedroom modern colonial home just shouts \"look at me\". And believe me, the inside doesn\'t disappoint. The entry foyer walks you past the formal dining room into the open concept living room (with a fireplace) and kitchen with a breakfast area and large walk in pantry. The \"kick back and relax\" media room is a real plus. Upstairs there are 3 almost equal size kids rooms, two bathrooms for them, a rec room or lounge area, and a great master suite with a tray ceiling. The 3 car garage should be big enough. 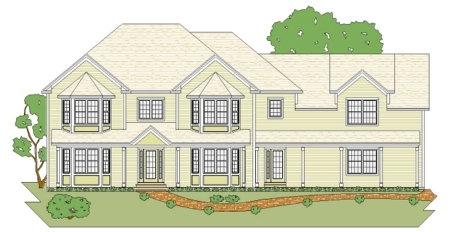 This large first floor living 4 bedroom modern colonial home plan offers plenty. The first floor boasts an open concept kitchen breakfast and living room, a formal dining room, a den or home office, a sun room or screen room, and a great master suite. 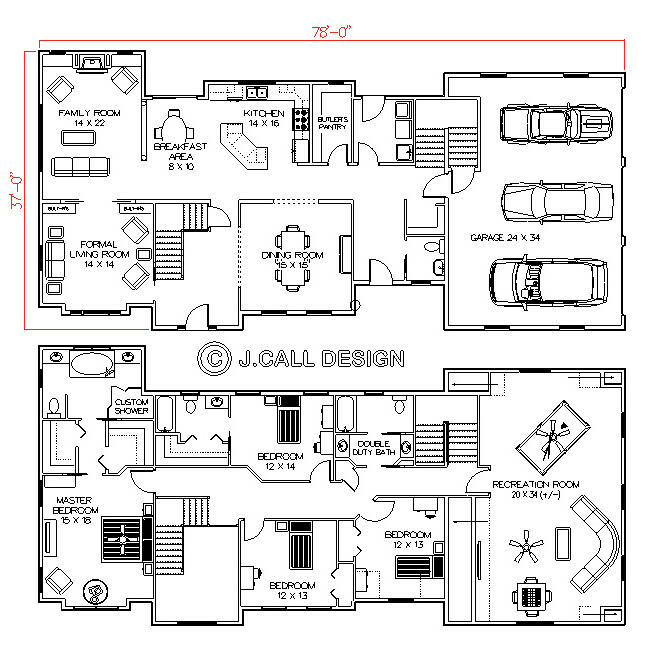 The second floor has two large kids rooms, 2 bathrooms, and a recreation room or man cave over the 2 car garage. The garage has our preferred cellar entry to the full basement. 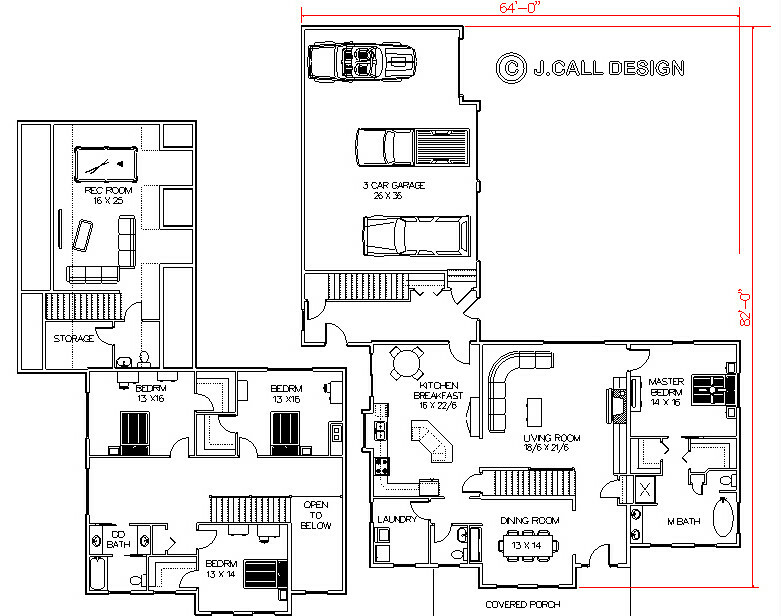 This first floor living modern colonial 4 bedroom home plan has a lot of class. The first floor has a 2 story entry foyer, a living room with a fireplace, a kitchen with a breakfast nook, formal dining room, a laundry and a master suite. The upstairs has 3 large kids rooms, and a double duty bathroom, and a hallway that could double as a study area. The 3 car garage has a recreation room or man cave overhead. 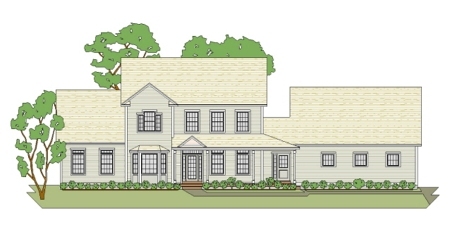 This is simply a very nice looking 4 bedroom modern colonial home plan with a great layout. 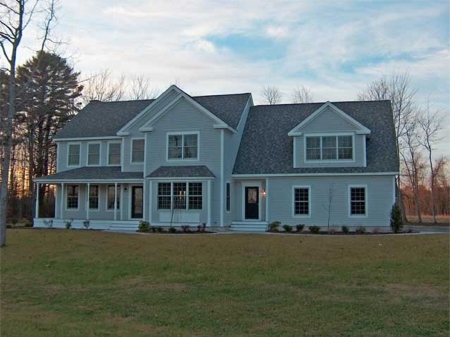 The first floor features an open concept country kitchen/family room, formal living and dining rooms. The second floor has 3 just about equal sized kids bedrooms, two baths for the kids, a laundry, a large recreation room, and a great master suite. This plan has it all. 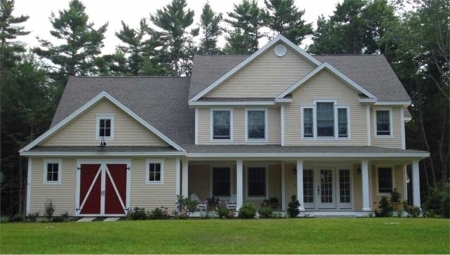 The 3 car garage with our preferred cellar entry is just "icing on the cake". Executive living at its finest. 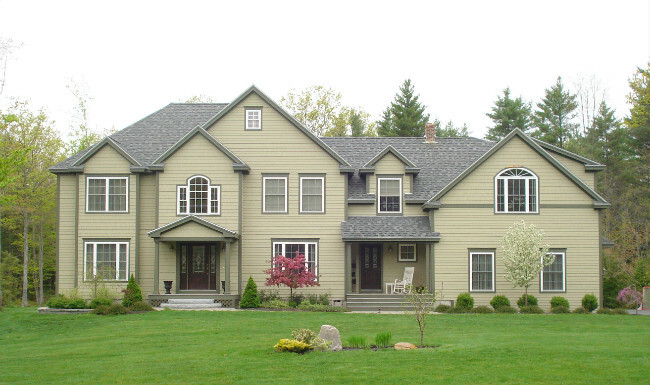 This absolutely beautiful 4 bedroom modern colonial home plan has everything you could want. The first floor boasts a large kitchen, breakfast, and dining room area, a family room with a fireplace and a tray ceiling, a formal living room and a home office. 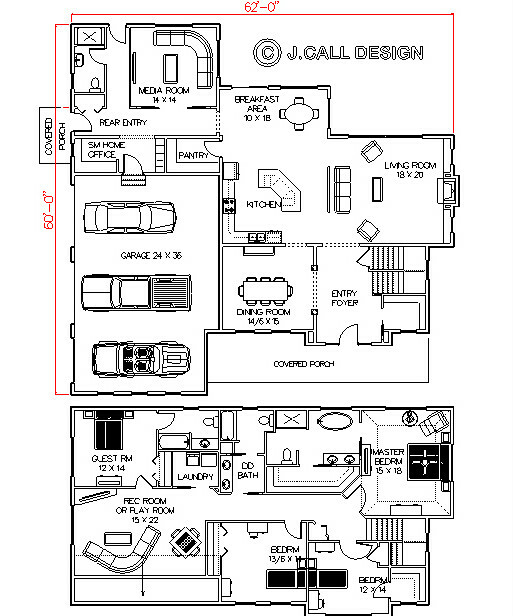 Not to be outdone, the second floor has two equal sized kids rooms with a shared bath, a larger bedroom with it's own bath, a recreation or exercise room, and a master suite with a bump-out reading bay. The 3 car garage tops it all off.